Preheat the oven to 190°C, gas mark 5. Spread the jumbo oats in a large roasting tin and bake in the oven for 15-20 minutes, or until golden brown. Tip into a large bowl and leave to cool completely. Mix together the remaining ingredients and toss with the oats. To serve, soak a portion of muesli in a little yogurt or milk, overnight in the fridge, ready for breakfast the following morning. Soaking the muesli softens the oats and gives it a lovely creamy texture. You can create a different breakfast every day of the week, by soaking the muesli in yogurt, milk, low-fat fromage frais or quark (very low-fat soft cheese). Add diced fresh fruits, such as pineapple, grapes, grapefruit, strawberries or peaches, or sprinkle with extra dried fruits, such as prunes, sultanas, apricots and cherries. On a cold morning, create a porridge alternative, by heating milk and muesli together until thick and steaming. Finish with a drizzle of honey before serving. 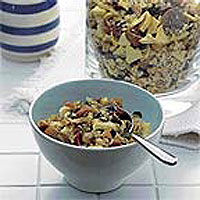 Store the muesli mix in an airtight container for 2-3 weeks.